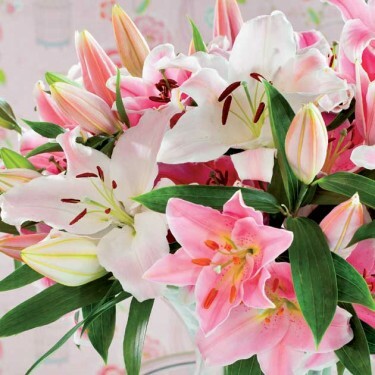 Nothing brightens a room more than our super-large, lusciously fragrant Oriental lilies in their dazzling mix of colours. 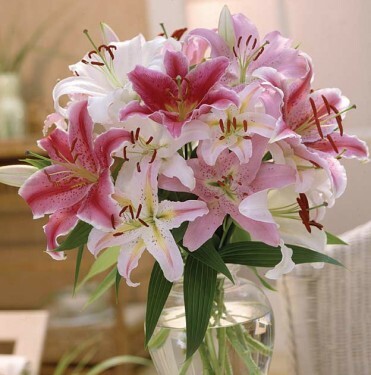 This is one of our most popular flower collections ever! Our special mix make wonderful cut flowers and when planted in groups, their fragrance can fill the garden. Since Oriental Lilies can grow to a height of 4 ft - 120 cm we suggest planting them in sun or partial shade protected from strong winds. Plant them 12 in - 30 cm apart in a rather heavy soil with an ample supply of humus and good drainage. Remove faded flowers and do not cut back stems until autumn. Bulbs should not be lifted but left in the soil to bloom annually for many years.